Full Size PLCE System 120 Litre DPM. 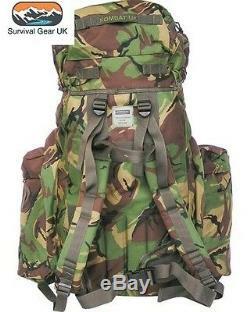 Full size PLCE 120 litre bergen Incorporating a versatile day sack system Connecting the two detachable pouches to the yoke (included) gives a useful 20 litre day sack 2 x zipped lid pockets Small front zipped utility pouch Side compression straps Padded shoulder straps and waist belt Removable internal aluminium frame Made from 600D Cordura Dimensions: 78 x 60 x 30cm. 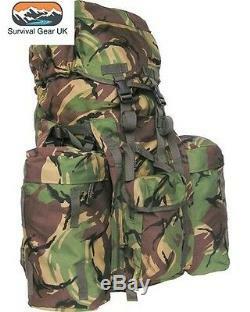 The item "MILITARY RUCKSACK 120 LITRE BERGEN DPM CAMO PLCE KIT BAG CADET BRITISH ARMY" is in sale since Monday, April 10, 2017. 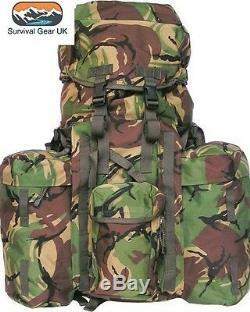 This item is in the category "Collectables\Militaria\Surplus/ Equipment\Bags".